Youngcare “was established in 2005 following the inspirational story of one woman’s battle to find relevant and dignified care. Currently more than 7,500 young Australians (under the age of 65) with full-time care needs are living in aged care simply because there are few alternatives (National Disability Agreement 2010). There are also 700,000 more young Australians being cared for at home by family and friends, often with limited support (Australian Institute of Health & Welfare 2007). 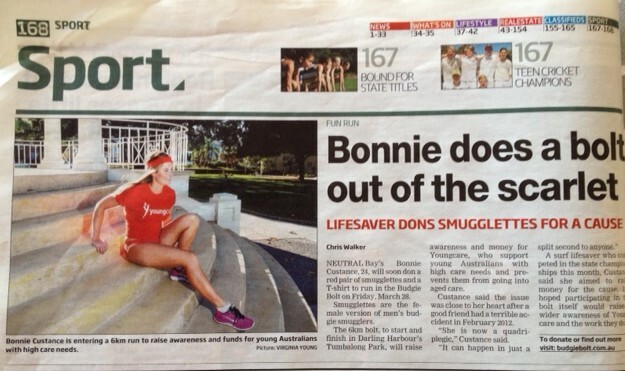 We will be at the 4pm start / finish in Tumbalong Park, Darling Harbour to boost Bonnie on her way. We will have a cookie in our picnic for her! This entry was posted in Advocating Ability and tagged Budgie Bolt, Fundraising, Youngcare by everydaycarer. Bookmark the permalink.